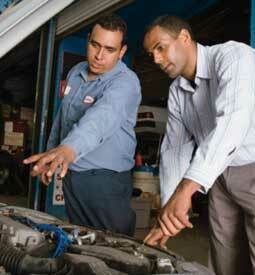 Train at home to pursue a new career as an Auto Repair Technician. The Penn Foster Career School Automotive Repair Technician Program, developed by leading experts in the field of auto repair, will teach you relevant skills and subject matter. Through interactive content, video animations, terminology challenge games, recorded lectures, and optional real-world practical exercises, you can train at home on your own time, at a pace that’s right for you! The Penn Foster Auto Repair Technician program was designed with your needs in mind. Like all our courses, it allows you to train for a new career from the comfort of your own home, without attending classes or quitting your job. Request information or enroll online and you could be working on your first lesson – in a matter of minutes! Your complete program includes information on lubrication systems, auto braking systems, auto engines, auto ignition and fuel systems, and more. You'll a learn about a variety of topics, including engine parts and operation, manual and automatic transmissions, heating and air conditioning, and much more. We’ll send you FREE information – with absolutely no obligation! Find out more about Penn Foster's Auto Repair Technician training.